Each of these carmakers is gearing up to be the next big thing in electric automobiles. Here is how they're charting success. Tesla Motors is already well-known for its all-electric two-seat Tesla Roadster sports car, which has received tons of media attention. The $100,000 vehicle recently went on sale, and so far about 900 have been sold -- many to wealthy Silicon Valley types. Tesla is just one of a handful of start-ups trying to muscle their way into the big leagues with plug-in cars. But they'll all have to take on the major automakers like Ford, General Motors and Nissan, each of which are working on their own electric cars. 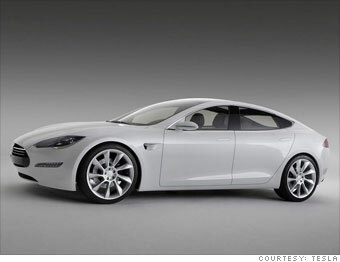 Now, Tesla is going after the mass market with a plug-in electric sedan dubbed the Model S. The car is slated for production in late 2011 and will cost about $57,000, but anyone who buys an electric car is eligible for a $7,500 federal tax credit. Tesla says the car can seat seven -- five adults plus two children -- if you get an optional third row of rear-facing seats. There are two trunks for luggage, one in the front and one in the back.